During a diplomatic mission, the ship is infiltrated by an alien of pure energy. 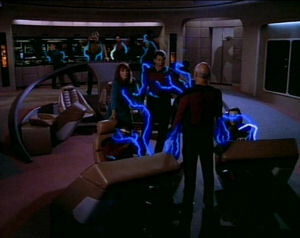 When Captain Picard begins acting strangely, the crew considers a mutiny. The Selay remind me of the snakeman from Dreamscape. How weird does Dr. Crusher have to act before anybody gets alarmed? I love it when Picard sarcastically quips "state of the art vessel" when it appears the ship is suffering from a series of technical malfunctions. Even in the 24th Century, some things never change. They need to give Wesley an episode or two off. His repetitive storyline--that the adults are constantly underestimating him because he's a precocious super genius--is getting old already, and the fact that it's been a part of nearly every episode so far is tiresome. I don't think the writers really knew how to move his character forward at this point. Poor Mr. Singh. He is the first crew member to die on the show, and I was just starting to like him. Hypnosis? For memory retrieval? Seriously? Ugh. I'm guessing Data's last posting was with a less formal captain. Otherwise, he'd probably act a little more professional, especially around Picard. While the Sherlock Holmes bit is amusing, Data takes it much too far. This rewatch is the first time I'm watching any of these episodes on a big HD television, and so it's really obvious whenever there's a green screen being utilized. The film grain always looks fuzzier. It's most apparent whenever any character is standing in front of a window of moving stars. I'm sure it would be even more noticeable were I watching this on Blu-ray. Why doesn't Dr. Crusher relieve Picard the second he admits there are other lifeforms within him? She said earlier that the only reason she didn't want to relieve him was the potential consequences if they were wrong about him. Once he outs himself, she has all the proof she needs, not to mention the moral imperative to protect the crew from an alien influence. Remember, the alien has already killed one crewmember. If you ask me, Dr. Crusher is in dereliction of her duty. If you're in a huge, life-and-death hurry to get to the transporter room, why can't you have the transporter chief just beam you there? Technically, with Picard having resigned, isn't Riker the Captain until Starfleet rejects or rescinds the resignation? You can't really tell it's him, but this is the first appearance of guest star Marc Alaimo. He plays the Antican Badar N'D'D in this episode, but he is best known for playing Dukat in DS9. We will see him again (several times) before he becomes Dukat. I'm really glad they decide to keep up with Data's fascination with Sherlock Holmes. It leads to one of my favorite bad guys on the show, the holographic Moriarty. Data quotes the famous Holmes maxim about eliminating the impossible, just as Spock does in Star Trek VI. This is another hint that the two characters share a special bond. How many episodes are there where members of the crew are subverted by an alien lifeforce? I can name several off the top of my head, so I'm going to start keeping track, just for giggles. The count is now at one. I know you see the Anticans again (usually as background aliens), but you don't see much of the Selay after this episode. Does that mean the Anticans managed entry into Starfleet, despite the apparent murder of the Selay delegate, and that the Selay were denied?